Editor’s Notes: This review was originally published on my FaceBook Page dated 10/21/2016. This was on a tour of downtown Phoenixville PA. Continuing our boozy tour of Phoenixville PA, we decide to have someone else make us a drink for a change. So I stopped to whet my whistle at Bluebird Distilling. Although a fairly young business, they still had a great selection of spirits and cocktails on their menu. We sampled two beverages: their Four Grain Bourbon, neat (meaning no water or ice) and their signature Bluebird Old Fashioned. Their Four Grain was really interesting for a fairly young whiskey. On the nose it didn’t smell like your typical whiskey, however. The best way I can put it is that it smelled like harvest time. I can’t say I know the exact ratios in the mash bill, but it worked well. It also had a maple tinged, sweet aftertaste that made me want to use this in a cocktail in the future. Moving on, we ordered their Bluebird Old Fashioned. I would like to start by saying that the bartender put this together like he was performing a Tai Chi form. He was fluid, precise, and delicate in motion. I was already elated to see someone who still had a f*** to give in spite of the sluggish job market, as I have been to plenty of “high end” bars where the servers were so flippantly uninspired that I almost asked to just get back there and make the $15 cocktail myself. 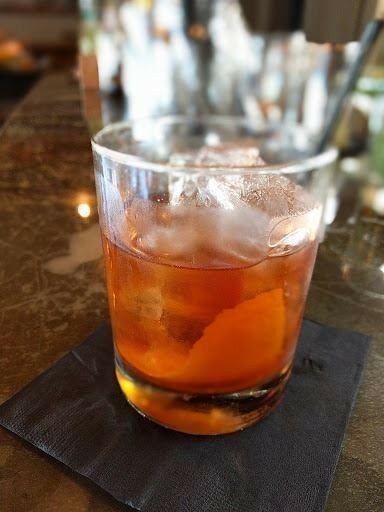 As described in the menu, this is made with Vanilla infused white rye, simple syrup, dark cherry, orange peel and bitters. I have had white rye whiskeys before and can’t really say I enjoyed them to a high degree. I’ll keep on sampling them, but I have come to terms with that fact that this just isn’t a spirit that I will ever come to love. At least for sipping, anyway. So it says a lot that I enjoyed this in a cocktail. The vanilla infusion really worked to help balance some of the overly sweet taste that you typically get from a White Rye. It tasted more like I was drinking a butter toffee candy. Clearly, if you’re in the Phoenixville area and want something unique, then make a point to stop by Bluebird Distilling. If you’re not into whiskey, don’t worry. What sets Bluebird apart from most places is that they also distill a wider assortment of spirits such as gin, rum, and vodka. Again, these are actually distilled in house and not merely packaged after getting a shipment from a huge mega distillery in Indiana. I will be returning soon to check out more of the range they produce. Drink up!